Last week the Justice Department indicted Springfield police officers citing gross misconduct for an incident from 2016. The DOJ was highly alarmed by the Springfield Police Department's pattern of abusive authority. The incident from 2016 included the physical assault of a teenage boy and an unlawful investigation of two more inside a jail cell. The SPD officers beat a 14 year old boy to the point of hospitalization. The boy suffered a fractured nose, two black eyes and head contusions. At the holding cell, Officer Gregg Bigda is caught on camera threatening the other Latino boys “Welcome to the White man’s world.” The officers promised to crush the boys’ skull and beat them to death. On the tape, officer Bigda can be heard telling one of the boys that people like them belong in prison. He states, if he wanted, he can plant drugs on them and lock them up for 15 years. Bigda was making his point which is that he can throw the kid in prison for years, beat him or kill him and nothing would happen to him or any of the officers. The issue here is that whenever there is a lack of police oversight, officers are prone to act without thinking and without fear of consequences. The video footage is also witness to the unlawful investigation that goes on behind closed doors. Intimidation, specifically, is a form of weapon hard to trace and quick to be executed by officers. Yet, the little transparency in law enforcement is not the only issue here. Instead, it’s the insufficient rules and procedures that fail to hold the police responsible for their actions. ​In the past years, Gregg Bigda has been accused of holding a civilian’s leg against a police cruiser’s hot tailpipe, breaking the jaw of a mentally disabled person and striking a pregnant woman in front of children. Even with such visible misconduct, Bigda continued working as an officer with little correction. As proven, police misconduct can be difficult to reprimand and the law doesn’t provide clear or sufficient procedures for disciplining officers. According to the ACLU’s December 2017 shared report, prosecutors are less likely to file charges against an officer than civilian suspects. Bigda is the main officer in the SPD case and his onset of police brutality is evidenced as far as 1997. The NAACP had demanded the Springfield Police Department to sanction officer Gregg Bigda who covered for an officer kicking a black man in the face. Now, twenty years later, Bigda along with three others are under investigation.The jail’s video showed that the officers were confident in their freedom from any liability. This is a clear product of a nation that’s still learning how to respond to law enforcement errors. The Springfield Police Department officers abused and threatened to kill Latino boys (age 14, 15, and 16) saying over and over again that this is their territory and they can do whatever they want. This overt and well evidenced incident may not be the typical case of police misconduct, however, it reflects a typical sentiment within law enforcement. The lack of accountability is acknowledged and even seen as an advantage at times. The SPD officers, both in their behavior and in their conversation, stated they would have impunity at all times. In 2017, the ACLU posted a report confirming that such immunity was reflected in the statistics and history of police accountability in the U.S. This is also the first federal investigation of any police department in Massachusetts and it confirms a pattern of police oversight. Though the DOJ’s 2018 intervention and its efforts to right wrongs is laudable, it also uncovers some ugly truths. It illustrates the way the government is reluctant to make amends until things have escalated. In every instance of these federal level investigations, a vile human rights violation and community unrest precedes any willingness to review and reform policies. In recent years, high-profile cases uncovered a lot of issues that have been overlooked. The ability for social activism and community disapproval pushes the government to make law enforcement safer. At the same time though, this shows a weakness in our system. The lack of accountability can be ignored until a gross misconduct makes headlines. The Springfield Police Department first made headlines when the videos of the interrogation were posted online. The recordings showed blatant racism, harassment and intimidation towards the teenage Latino boys. Events like this turn the dialogue to asking questions like who is going to police the police? As incidents similar to the SPD’s treatment of the Latino boys surfaces, it is revealing the unreliable and defunct method of redress and sanctioning. It illustrates a discretion that is too broad and unsanctioned in law enforcement. The Boston Globe interviewed Emily Gunston, a former Justice Department official in which she warned “investigators in the past have focused on departments that appeared to be ‘among the worst of the worst’ in the country.” This culture of checking the police can be worrisome. It misses the point of positive community outcomes which should be a main goal and method of measuring good policing practices. As of now, it’s a limited method of accountability because it can only be invoked when something so bad has occurred that we must investigate it. This undermines the entire system of trust and safekeeping which is the central focus of police departments. It allows for a desensitized and negligent treatment of citizens completely disregarding the actions of officers until it’s so abusive tha it must be checked. Although the Justice Department is making a step in the right direction, it’s only a start. It is not sufficient enough to enable us to rethink and rework our understanding and practices of policing in this country. At such a time in U.S. history, a look into new training programs, a more community based approach and a more effective means of accountability is needed. The topic of sexual assault is coming to light more so this past year it seems than ever. For a long time, there has been a silencing of victims along with a difficult process for anyone who wanted to come forward. Many factors contributed to this condition. To start, there is the historically futile legal process which is scary and often, unsuccessful for most. Additionally, there is the fear of retaliation and shame that--for a really long time--has been an accepted norm in our society as a response to sexual assault claims. Yet, this last year sparked a possible changing of gears in terms of how we understand and talk about them. However, there is also many other cases that remind us progress has started but it hasn’t went very far. On October 6, 2018, Brett Kavanaugh was sworn in to the United States Supreme Court. After Christine Blasy Ford’s testimony on Kavanaugh’s unwanted sexual advances on her, it reminded us the words of a victim can mean nothing especially when addressing men in high places of power. The 2018 EEOC report does offer some hope to a growing number of accountability and redress for sexual assault survivors. One year after the #MeToo movement begun, the U.S. saw an increase in victims making complaints in employment cases. The agency filed 66 harassment lawsuits in 2018, including 41 that contained allegations of sexual harassment. That reflects more than a 50 percent increase over FY 2017 in sexual harassment suits. This is notable considering between 2000 and 2017, the number of sexual harassment charges filed with the EEOC were declining. Some try to explain this decline over the 17 year period as a result of employers doing a better job handling sexual harassment complaints. They claim this led to more cases settling without needing to be referred to the EEOC. Whether this data can be proven or not is unknown, but the unprecedented rise of claims this fiscal year is a better indicator of where we stand as a country now. It highlights the many problems that are only starting to surface on a national scale. It sheds light on the work that needs to be done and maybe holds some promise that this can be a turn around. Regarding sexual harassment in the workplace, there is a lot to be done on the side of the employer before a case even heads to court. It is pertinent that employers are trained and well informed on the best approaches and responses. The EEOC’s announcement also recommended its training program, Respectful Workplaces, which teaches skills for employees and supervisors to promote and contribute to respect in the workplace. The agency says more than 9,000 employees and supervisors in the private, public, and federal-sector workforces participated in Respectful Workplaces trainings during FY 2018, and an additional 13,000 employees participated in EEOC’s anti-harassment compliance trainings. The Little Rock Nine’s attendance at a previously all-white high school was a milestone in the history of school desegregation. One may expect that decades after the Little Rock Nine endured horrible racism and violence to achieve integration, schools would be mostly or even completely desegregated. Although integration has been legally enforced for decades, American public schools still remain largely segregated. Carlotta Walls LaNier, a member of the Little Rock Nine, stated "Brown versus Board of Education, and let me tell you. The Civil Rights Act, the Housing Rights Act, the Voters Rights Act, that's all progress, and it all came from that foundation. So I'm not going to sit here and say that we're still living the same way, but I do see this pendulum swinging back in that particular direction [of the Jim Crow era]" (LaNier, Colorado Public Radio). 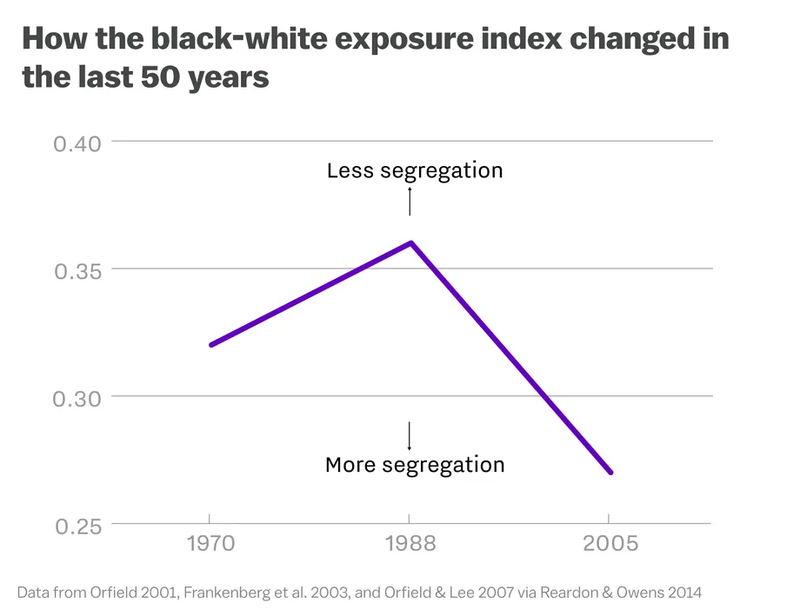 The graph above shows racial segregation in schools as measured by black-white exposure. The black-white exposure index measures the degree to which African Americans and white people are exposed to each other. The graph shows that after integration in schools was enforced, black-white exposure increased until 1988. After 1988, black-white exposure decreased dramatically. The sharp decrease in African Americans and white people being exposed to each other suggests that racial segregation has increased. Many people argue that racial re-segregation is not occurring, but rather that economic segregation may be occurring. This argument suggests that economically advantaged and economically disadvantaged families are becoming more distant from other with regards to location. Such separation results in their children being isolated from each other in schools. However, race and economic status are not so easily detached. Across the U.S., about 75% of African American and Latinx students attend lower income schools, whereas only about 33% of white students attend such schools (The Atlantic). These statistics highlight the close relationship between race and economic status. This relationship suggests that while economic segregation occurs, so does racial segregation. The return of racial segregation is apparent to Carlotta Walls LaNier. She stated “We're 60 years and I'm looking at some of the same things that happened to me prior to that” (LaNier, Colorado Public Radio). The return of school segregation disrespects everything that LaNier and the other members of the Little Rock Nine endured and sacrificed in the name of integration. 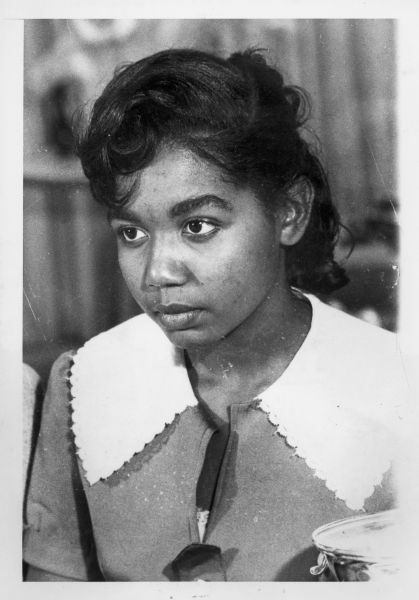 Gloria Ray Karlmark was 15 years-old when she entered Little Rock Central High School. Due to the color of her skin, she was harassed, threatened and abused regularly when she attended the previously all-white high school. For example, one white classmate consistently called her names and bumped into her. One time, the student knocked her across the floor. She endured hatred and violence to achieve racial integration in schools. Unfortunately, the Governor of Arkansas, Orval Faubus, refused to allow integration to continue to occur, so he closed all of Little Rock’s high schools. After Faubus closed all of Little Rock’s high schools, Karlmark and her family moved to Kansas City, Missouri, where she completed her high school education. She then studied at Illinois Institute of Technology, where she earned her Bachelor of Science in Chemistry and Mathematics. She went on to work as a research assistant at the University of Chicago Research Medical Center. Karlmark later worked as a technical writer and systems analyst for the International Business Machine’s Nordic Laboratory in Sweden. She stayed in Sweden and studied patent law at Kungliga & Registreringsverket. After graduating, she practiced as a patent attorney for a few years. Karlmark then founded and became editor in chief of an international journal entitled Computers in Industry. She has since worked in Hilversum for Philips Telecommunications and in Eindhoven for Philips Lighting. Karlmark eventually retired in Amsterdam. Karlmark has been recognized for her bravery and determination as a member of the Little Rock Nine. She earned the Spingarn Medal from the National Association for the Advancement of Colored People. She also received the Congressional Gold Medal from President Clinton. Gloria Ray Karlmark and the rest of the Little Rock Nine were extremely influential to the Civil Rights Movement. Terrence Roberts was only 15 years-old when he joined the fight for racial integration. Roberts enrolled at Central High School because “At age 15 I had already learned enough about what it meant to live under the oppressive conditions of legalized discrimination. I was primed and ready for change” (Roberts). Roberts endured hatred, threats and violence to achieve racial integration. Unfortunately, the efforts Roberts and the other members of the Little Rock Nine were temporarily halted when Arkansas’ Governor, Orval Faubus, closed all of Little Rock’s high schools to stop integration from occurring. Since Central High was closed, Roberts moved to Los Angeles, California to complete his high school education. He then earned his Bachelor of Arts in Sociology from California State University, Los Angeles. He also received a Master of Arts in Social Welfare from the University of California, Los Angeles (UCLA). Roberts also earned his Ph.D. in Psychology from Southern Illinois University. He has since worked as a professor at Pacific Union College and the Antioch University Los Angeles. Roberts has also been the assistant dean of the School of Social Welfare at UCLA and co-chair of the Master of Arts in Psychology program at the Antioch University Los Angeles. He has also served as the Director of Mental Health at St. Helena Hospital and Health Center. Currently, Roberts runs a management-consulting firm. Roberts has been recognized extensively for his life’s work. He received the Spingarn Medal and the Legal Defense and Education Fund, Inc. Award from the National Association for the Advancement of Colored People. He also earned the Congressional Gold Medal, which was given to him by President Clinton. Roberts’ work was also celebrated when he was given the Martin Luther King Jr. Drum Major for Justice Award. He was also presented with the Robert S. Abbott Memorial Award. Roberts’ teaching was recognized when he was awarded Outstanding Teacher of the Year from the College of Human Resources at Southern Illinois University. Terrence Roberts has spent his life learning about and directly advocating for social justice. ​Melba Pattillo Beals was eager to enroll at Central High School when the opportunity arose. She stated “I thought about all those times I’d gone past Central High, wanting to go inside… I reasoned that if schools were open to my people, I would also get access to other opportunities I had been denied…” (Beals). Beals was inspired to enroll at Central High after visiting desegregated Cincinnati, Ohio. On this trip, she was treated like a full human being as opposed to being treated as less than one in the South. She also wanted to attend Central High because it had a prestigious reputation and provided much greater educational opportunities than did segregated African American schools. When they began studying at Central High, Beals and the other members of the Little Rock Nine were consistently harassed, threatened and abused. For example, a male classmate approached Beals with a water gun filled with acid and shot the acid into her eyes. Luckily, she was able to wash the acid out in time to preserve her vision. Beals and her African American classmates endured more violence than many people can even comprehend in order to achieve racial integration in schools. After Governor Faubus closed all of Little Rock’s High Schools, Beals moved to California, where she completed her high school education. While she was in California, she lived with sponsors who were members of the National Association for the Advancement of Colored People. She went on to earn her Bachelor of Arts in Journalism from San Francisco State University. She also earned her Master of Arts in Journalism from Columbia University. Beals has gone on to work as a reporter for NBC’s Bay Area affiliate and a public television station in San Francisco. She has also done motivational speaking and worked as a communications consultant. ​Beals received the Spingarn Medal from the National Association for the Advancement of Colored people and the Congressional Gold Medal from President Clinton. 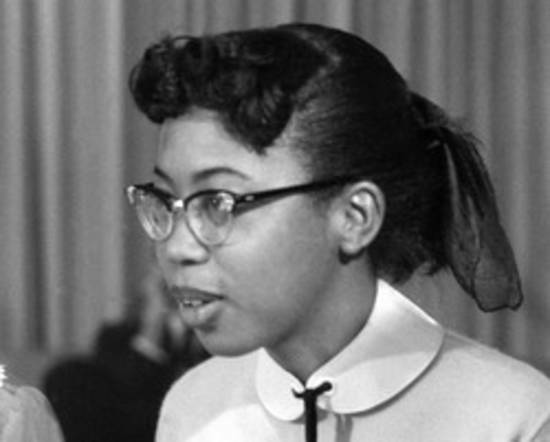 She was also the first member of the Little Rock Nine to write a book about what she experienced at Central High School. Titles of her books include Warriors Don’t Cry, March Forward, Girl: From Young Warrior to Little Rock Nine, and I Will Not Fear: My Story of a Lifetime of Building Faith Under Fire. Melba Pattillo Beals is recognized for her immense role in the Civil Rights Movement. 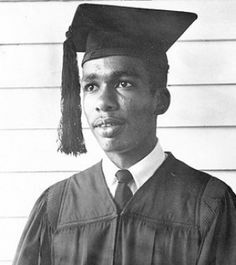 Ernest Green was the oldest of the Little Rock Nine, entering Central High School his senior year. At this school, he and the eight other African American students were subjected to harsh racism and violence. Green stood up for his right to attend central because “My parents instilled in me the belief that if I fought hard enough, I could compete on an even playing field with everyone else. This is partially what drove me to be one of the first black students to integrate at Central High School in Little Rock, Arkansas” (Green). Green went on to become the first African American to graduate from Little Rock Central High School. After graduating from Central High, Green earned both his Bachelor of Arts in Social Science and Master of Arts in Sociology from Michigan State University. Green then worked in the field of employment law. He took on an apprenticeship with the Adolph Institute, which helps minority women find professional careers in the South. He also directed the A. Phillip Randolf Education fund. Green eventually served as the Assistant Secretary of Housing and Urban Affairs under the Carter administration. He has since worked in the field of investment banking. Ernest Green has received awards and recognition for his lifelong commitment to racial equality. He received honorary doctorates from Central State University, Tougaloo College and Michigan State University. Additionally, Green received the Spingarn Medal from the National Association for the Advancement of Colored People and the Congressional Gold Medal from President Clinton. He has also served on boards for several organizations, including: The National Association for the Advancement of Colored People, the Winthrop Rockefeller Foundation and the African Development Foundation. He was also honored at his graduation from Little Rock Central High School when Dr. Martin Luther King Jr. attended. Dr. King attended because Green was the first African American to graduate from Central High and he symbolized a milestone in the history of racial integration. Thelma Mothershed Wair attended Little Rock Central High School for her junior year. Since Governor Faubus closed all of Little Rock’s high schools the following year to prevent integration, Wair attended summer school and took correspondence courses to earn the credits necessary for a high school diploma. She then earned her Bachelor of Arts in Home Economics, her Master of Science in Guidance and Counseling Education, and an administrative certificate in Education at Southern Illinois University. Wair then spent 28 years of her career as a home economics teacher. When reflecting on her time as an educator, Wair stated “I was determined to treat my kids equally” (Wair). This determination likely stemmed from her experiences directly combating unequal treatment of students. She also taught survival skills to women at a Red Cross homeless shelter and worked at a juvenile detention center. ​Wair has received recognition for her teaching and involvement in the Civil Rights Movement. She was recognized as an Outstanding Role Model by the Top Ladies of Distinction in east St. Louis and the early childhood/pre-kindergarten of her school district. The National Association for the Advancement of Colored People awarded her the Spingarn Medal. She also earned the Congressional Gold Medal, which she received from President Clinton. Both as a student and a teacher, Thelma Mothershed Wair embodies the concept of equality in schools. Kelly Coltrain, a twenty-seven year old woman, was incarcerated in a Nevada county jail because she did not pay her traffic tickets on time. Feeling unwell, she asked to go to the hospital. As her condition worsened instead of being allowed treatment she was handed a mop and instructed to clean up her own vomit. She died less than an hour later. Even after a deputy noticed she was unresponsive no medical personnel were brought to the scene, and she lay dead in her cell for hours. Elizabeth Eckford was the only member of the Little Rock Nine to arrive at the first day of school alone. The night before, following the announcement that the National Guard would be at Central High, it was arranged for all of the African American students to arrive at school together. However, Eckford’s family did not own a phone, so she was not informed of the new plan. She recalls that “The night before when the governor went on television and announced that he had called out the Arkansas National Guard, I thought he had done this to insure the protection of all the students” (Eckford). She was unaware of the fact that the National Guard was actually called in to prevent the African American students from entering the school. When she arrived alone, she was harassed and threatened by the mob that surrounded the school. White people called for her to be lynched, told her to go back to Africa and yelled racial slurs at her. When she attempted to enter the school, members of the National Guard prevented her from doing so. It was only after being denied entry by several troops that she realized the real reason for the National Guard’s presence. Although federal troops were eventually sent in to ensure that the African American students could attend school and protect them, the students still faced harassment and violence constantly. For example, during school, white students threw vegetables and eggs at Eckford, spat on her, and punched her. Unfortunately, Eckford has faced depression and trauma throughout her life as a result of the abuse she endured while attending Little Rock Central High School. Elizabeth Eckford has received numerous awards for her courage and bravery as a member of the Little Rock Nine. She received the Spingarn Medal from the National Association for the Advancement of Colored People. She also earned the Father Joseph Blitz Award from the National Conference for Community and Justice. Furthermore, she was presented with the Congressional Gold Medal by President Clinton. Eckford also wrote a book entitled The Worst First Day: Bullied while Desegregating Central High. Elizabeth Eckford is celebrated for the enormous role she played in the Civil Rights Movement. The haunting image of Eckford being screamed at by white people brought international attention to the issue of American racial segregation.